Joe Louis: Named Greatest Heavyweight by IBRO. In 2005 The International Boxing Research Organization (IBRO) named Joe Louis as the greatest heavyweight-boxing champion of all time. “The Brown Bomber” had the longest uninterrupted title reign and the most successful title defenses in heavyweight history. Louis is highly respected by historians because he is regarded as the finest boxer-puncher ever filmed. He threw every punch with textbook perfection and put his entire body into his punches. He was one of the most fundamentally sound boxers ever seen, and was the best in a combination of both boxing skills and punching power. Joltin’ Joe could jab, box, feint, counter, and set up his punches with wasteless efficiency. Many today do not appreciate or understand how fundamentally flawless Joe Louis was. Some think of him as having poor footwork and lacking the maneuverability of some more modern champions such as Muhammad Ali or Larry Holmes. However “good footwork” means more than dancing around like a bunny rabbit to avoid punches. 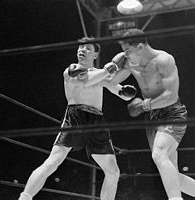 Footwork was used by Joe Louis to cut the ring by stepping forward and then drawing opponents into his punches by making subtle steps back. By pressing forward, inch by inch he would close the distance on his opponents and then by stepping back Louis would appear vulnerable, but when his opponent’s moved in they were setting themselves up for his lethal counter-punches. Footwork can be used to create and close distance for balanced punching, not just dancing away as some fans think today. One example of Louis ability of pressing and then stepping back to draw his opponents in can be seen from a brief description of one of his early fights against Art Sykes. The Oct 25, 1934 Chicago Tribune reported, "Joe stepped back for an instant, got the range and shot a right cross to the jaw. Sykes fell on his back, his head hitting the platform outside the ropes. He took referee Davey Miller's count without stirring, and it was several minutes before he was able to leave the ring." " No Human body can take the punishment that Jolting Joe dishes out once he goes after his prey"
Joe Louis power shots were absolutely paralyzing. If one carefully studies Louis films one notices that his shocking punches momentarily freeze his opponents. Once stunned they are then finished off with some of the greatest rapid-fire combination punching in boxing history. His punching accuracy was the best ever seen in a heavyweight boxer, which is why many boxing historians consider him as the greatest offensive fighter amongst the all time heavyweights. Joe Louis had far more power than heavyweights of much greater size. In terms of shocking punches he was at least the equal of Mike Tyson. Tyson at his peak weighed 216 pounds for Michael Spinks, not that much "bigger" than Louis strongest weight of 207, his weight when he destroyed Abe Simon and Buddy Baer in rematches. Joe Frazier weighed only 205 when he dropped the ever-durable Muhammad Ali. Earnie Shavers considered one of the hardest hitters amongst all heavyweights weighed 211 for his title shots at Muhammad Ali and Larry Holmes, only 4 pounds difference from Louis best fighting weight. It's not about size, but technique, explosive speed, a sense of timing and distance which are attributes that Louis had in abundance. Ring Magazine founder Nat Fleischer writing in the April 1939 Ring Magazine said, "No human body can take the punishment that Jolting Joe dishes out once he goes after his prey. That has been proved conclusively in his last few contests." No human body. It didn’t matter how big they were. Louis sends the 6' 6" 250 lb. Buddy Baer down for the count. Louis absolutely feasted on large targets. This can be easily seen by anyone who seriously studies the films of his fights. In his first fight with the Lennox Lewis sized Buddy Baer he spun his foe to the canvas with a right hand that traveled about 6 inches. It looked much like the right hand that Mike Tyson hit Frans Botha with. While not a great fighter, Buddy was as big as modern heavyweights and he was a legit contender with a respectable 50-5 record at the time. Buddy was absolutely destroyed by Louis in two fights. Louis proved he had the power to not only knock out heavyweights of "modern" size but to utterly annihilate them. Abe Simon was as big as the old George Foreman, and he had a similar build about 260 pounds, with huge back and shoulder muscles and a square jaw made to absorb punishment. Simon held a knockout victory over Jersey Joe Walcott, yet Louis blazing punches, especially in their second fight, crushed him. If James Toney, a blown up middleweight, can outbox John Ruiz who was competitive with and beat big modern heavyweights, then what would Joe Louis do? No matter how you slice it Louis hit much faster and harder than Toney. Why was Toney successful? Because he has boxing skills and good punching accuracy. Although Toney fights rather flat-footed that has not kept him from beating today's contenders and champions. 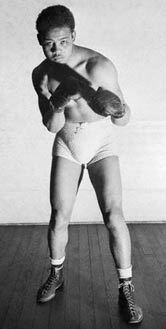 Despite his success, Toney’s technique and punching power pales in comparison to that of Joe Louis, who was the most elementary sound, efficient and accurate punching heavyweight in history. Former heavyweight champion Max Baer, at 6’ 3”, 210 pounds and an 81-inch reach was about the same size as Muhammad Ali in his prime. When he met Joe Louis in the ring, he was only one year removed from having lost the heavyweight title on an upset decision to “Cinderella Man” James Braddock. Max had never been off of his feet in a boxing match prior to facing Louis. Baer had a proven tough chin, yet Joe took him apart with fearsome two- handed combinations of such speed and power as to be astonishing. Who, having seen it on film, can ever forget Louis awesome triple left hook? Louis doubled up on his jab, hooked off the jab, and threw perfect straight right hands in combination. He showed forward and backward movement and was not at all a “plodding fighter” as some critics who have never really studied his films have labeled him. Fighters who ran from Louis had limited success, but even the best of them such as Bob Pastor, a highly under-rated fighter who beat most of the uncrowned black heavyweights of the late 30’s and early 40’s was knocked out by Louis in their title fight, as was the clever Billy Conn, and even a aging, fading Louis caught the super slick Jersey Joe Walcott and knocked him out in their second fight. Why? Because once they moved in to attack Louis, when they thought he was vulnerable, they were playing right into his game. He was setting them up for his cobra like strikes. And once he caught them it was over. Once Joe Louis had his man hurt there was no surviving. His ability to finish a fighter once hurt is virtually unparalleled, demonstrating his ability as the greatest puncher ever. Nat Fleischer rated Joe Louis as the greatest finisher in boxing history in his book 50 Years at Ringside, and there is no question about Joe's ability to finish an opponent when hurt. He didn't let them off the hook once they were in trouble. Veteran Louis watchers would reach for their hat once Joe started landing his big shots, they knew the end was at hand. It didn’t matter how tough or iron chinned Louis opponents were. Arturo Godoy was a physically strong, bullish, awkward fighter who was known for a strong chin. He had never been knocked off of his feet in 70 professional fights, including his first fight with Louis. In their second fight, Louis put on a clinic in how to take apart a crouching fighter. Joe demonstrated under-rated footwork in obtaining punching angles as he slid left and countered with sizzling right hands, and slid to the right firing hammering hooks, and he caught Godoy coming in with smashing uppercuts with both hands. Godoy was pounded to the canvas 3 times by Louis precise counter-punches and combination punching. Louis was also a debilitating body puncher. He literally paralyzed Max Schmeling against the ropes. Emmanuel Steward after studying film of Louis-Schmeling 2 observed, The 12 Greatest Rounds by F. Pacheco, "Louis body punches were unbelievable. After Max had been immobilized by a right to the kidney, he took a left hook to the solar plexus which paralyzed him. Even though Max was hurt and wanted to fall down, he couldn't even fall." Schmeling, in the NY Times, said he went temporarily blind from the power of Louis body punches. I don’t recall any of Vitaly Klitschko's opponent's, for example, ever making such a claim. You want to talk about pure power? How about Louis fight with Paulino Uzcudun! Louis threw a straight right hand so hard that Uzcudun's cornerman Ray Arcel said, "Louis drove Uzcudun's teeth right through his mouthpiece.” Veteran referee Arthur Donovan said, “It was the hardest punch I ever saw." So damaging was the blow that 20 minutes later Uzcudun stood up in his dressing to take a shower and fell over. James Braddock said that Louis also drove his teeth through his mouthpiece, "I thought my head had been blown off," he explained. Not George Foreman, not Mike Tyson, and certainly not Riddick Bowe or Lennox Lewis ever threw a punch that did that kind of teeth driving through the mouthpiece kind of damage. Perhaps only Rocky Marciano compares to Louis for one punch power, although he was not at all an accurate place puncher like Joe Louis. Louis stands up well when compared to modern heavyweight hitters. Riddick Bowe, for example, did not throw a correct straight right cross and had a tendency to hook with his right hand. Bowe had power because of his size but it does not compare to Joe Louis perfectly straight, fast and explosive punches. Lennox Lewis was a powerful straight hitter but he lacked Joe's hand speed and punching accuracy in combination, as well as his killer instinct as a finisher and therefore cannot rate ahead of Louis as a puncher. Mike Tyson had the speed, raw power, explosiveness and killer instinct, but lacked the punching accuracy of Joe Louis and Tyson's combinations were far more predictable. None of the great heavyweight hitters rate ahead of Joe Louis in all around ability as a boxer or a puncher. Joe Louis had the speed, accuracy, power and explosiveness to take out bigger, slower, modern heavyweights, which is one reason Louis shines brightly in the eyes of boxing historians. Joe also was a superb technician who made opponent's pay for mistakes and could dissect any opponent's style once he understood them as his record of 10-0 in rematches demonstrates. His chin is oft berated but its nonsense. While Mike Tyson, for example, may have had a strong chin for absorbing a single blow, Louis fought better when hurt and showed better recuperative ability than either Tyson or Lennox Lewis, neither of whom ever won a fight they went down in. Louis was knocked out of the ring by Buddy Baer in their first fight but calmly climbed back in like nothing happened and immediately took control of the fight. The ability to come back when hurt is the sign of a great fighter. Louis demonstrated that he had toughness and durability. Except for the first Schmeling match when he was young, overconfident and under trained Louis was never closed to being stopped in any of the fights he went down in, retiring as champion with a 60-1 record (51 ko’s) before making an ill-advised comeback. Louis could take a strong punch, had proven staying power and the ability to come from behind and win which is what greatness is all about. Some critics question Louis level of competition but that criticism can be leveled at any heavyweight champion with the exception of Muhammad Ali. Louis competition is better than many give him credit for. Louis never fought a preliminary fight in his career and fought in main events from the beginning. He cleaned out the division on the way to the title. He defeated 6 men who held the heavyweight championship of the world, and two excellent world light-heavyweight champions. His near 12-year reign and 25 successful title defenses are division records that likely will never be broken. Joe Louis was a great all around performer, a heavyweight who could jab, box cleverly and set his man up. He had speed of hand, incredible punching power, superb accuracy and he was a killer in the ring. Joe threw perfect, short, and accurate picture book shots. 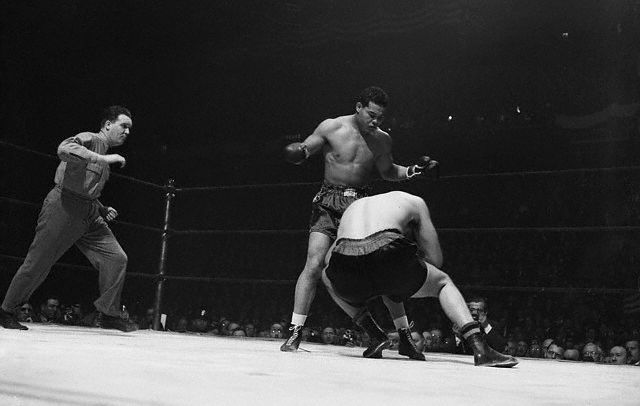 William Detloff wrote, Ring Almanac 2004, “All the blows in Joe Louis arsenal were so perfectly and precisely thrown every time that you get the sense watching him that he couldn't have been wild or sloppy if he tried." Any technical mistake by any opponent was duly punished by his quick and deadly counterpunching. Gene Kessler of the Chicago Times penned, "He glides over the canvas with the greatest of ease, coolly jabbing with a flicking left and whistling a short, devastating right into the smallest of openings.” Joe Louis was a master of timing, distance and positioning, and he was the greatest boxer puncher of all time. He is worthy of consideration as the greatest heavyweight champion of all time and one who would certainly be champion if he were fighting today.